Help make dreams come true – Sponsor a Child in the Philippines! Now more than ever the children in the areas we provide services are in need of international support, due to the devastation caused by Typhoon Yolanda (Haiyan) in 2013. For $300 USD a year (or $25 USD a month) sponsors can help provide the basic necessities to children from disadvantaged families and supply them with access to education, food, social support, and medical care, while restoring their sense of dignity and hope for success in the future. All VFV Sponsors are given the opportunity to receive cards and correspondence from their sponsored child, while at the same time receiving regular professional updates from our professional Child Sponsorship staff. 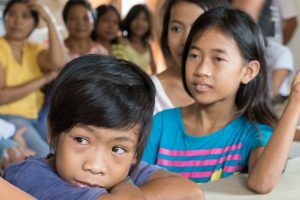 Volunteer for the Visayans takes pride in its unique multi-faceted structure and has been working diligently since 2004 to improve the lives of almost 170 children from disadvantaged families through our Child Sponsorship Program. Why Sponsor a Child With VFV? VFV’s Child Sponsorship program sets itself apart from other sponsorship programs by providing our children and their families with many additional benefits, that come as a result of the multi-faceted nature of Volunteer for the Visayans. In this family, the father is employed but earns substandard wages, while the mother is a homemaker burdened with child-caring and household responsibilities. Too often, there is not enough money for family members to eat three meals a day, to obtain health care, or to purchase school supplies for the children. The family is faced with survival challenges each day and social opportunities for the children are limited. To address this family’s needs, VFV provides the family with a monthly food subsidy; enrolls the mother in our Mothers Club where she can gain self-sufficiency skills and receive peer support or establish a livelihood opportunity for the father; provides health care and nutritional lessons periodically; provides the sponsored child with a school uniform and supplies, academic monitoring, tutoring, health monitoring, and a daily feeding; and involves the sponsored child in enrichment activities. The child also is helped to develop a supportive relationship with his sponsor. Additionally, sponsorship families are eligible to be selected as recipients of our Build-A-Home Project, which helps families who live in unsafe structures to renovate or rebuild their houses. To this end, the Volunteer for the Visayans Child Sponsorship Program is not merely a stand-alone project, but is in fact at the heart of a culmination of focused welfare services. Choose to Sponsor A Child in the Philippines today with VFV and you will not only improve the life of a disadvantaged child, but will also gain the opportunity to create a long lasting unbreakable bond with your sponsored child. Pingback: School’s out for Summer!